There’s also the chance that giving someone a product to address a specific concern, like tough acne or signs of aging, might not be interpreted by the recipient the way you intended (whoops!). Never fear—we have some can’t-miss picks that are perfect for you to consider. 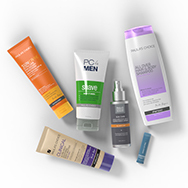 Well-formulated skincare basics are always appreciated: If the person you’re shopping for loves the outdoors, sunscreen is a thoughtful gift. For a high-SPF option that isn’t slick or slippery, select our water-resistant EXTRA CARE Non-Greasy Sunscreen SPF 50; for sun protection and quick reapplication on the go, add SUNSCREEN Spray Broad Spectrum SPF 43. For that friend who’s forever applying lip balm during the day, pick LIPSCREEN SPF 50. Both formulas moisturize without fragrance or flavor, and provide broad-spectrum sun protection—remember, lips can get sun damage, too! Treating someone to luxuriously moisturizing skincare is also a great way to go. A multitasking product like LIP & BODY Treatment Balm has a rich texture that transforms dry skin on lips, elbows, and heels—and can even be used as a cuticle cream; after all, who doesn’t have issues with dry cuticles? Treat the hard-working woman in your life to a spa-like experience with our RADIANCE Renewal Mask. This sleeping mask has a silky gel-like texture that provides overnight hydration and luminosity. Want more? Our RESIST Anti-Aging Eye Cream’s balm-like texture is like a super-hydrating overnight mask for world-weary eyes showing signs of fatigue and dehydration. Both will earn you the title of Brilliant Gift-Giver!